Rivets provide an effective way to fasten two materials together without welding, adhesives, or any specialty tools or skills. They can be used in automotive and non-automotive applications, but for this article we’re going to focus on automotive rivets. Automotive rivets can be used for structural repairs such as attaching a slip-on rocker panel over top of an existing rocker panel, mounting of plastic bumper covers and other accessories, or even specialized body repair work such as installing an aluminum bedside on a Ford F150. They are also a good option when securing two finished materials such as painted surfaces. As you can probably imagine, there are a lot of different styles of rivets. The two most common styles are Metal Blind Pop Rivets and Nylon Blind Pop Rivets. The blind rivet style is popular because it is strong, secure, and access is only needed on one side of the materials that are being worked with. They also allow for different types of materials, such as steel and aluminum, to be easily attached to each other. Rivets consist of two parts: the rivet body (A) and the mandrel (B) – see image below. To install, place the rivet body into a hole in the materials to be joined until the rivet body lip is flush against the material surface. Once in place, slide a rivet gun with the proper sized adapter over the rivet mandrel until the adapter is flush against the rivet body surface. Squeeze the rivet gun to pull the rivet mandrel. 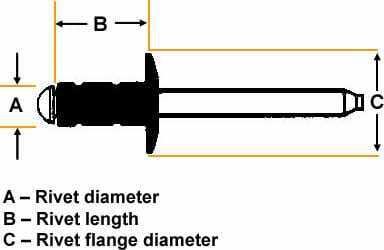 The rounded end of the mandrel pulls in on the rivet body causing it to expand to the size of the hole that it is placed in, while also forming a tightly clinched load-bearing area on the rear side of the material. Once the tensile strength of the mandrel is reached, it will break off, leaving a secure and smooth installation. Some mandrels, like on a blind pop rivet, also retain a portion of the mandrel within the rivet body, providing a higher strength connection. Aluminum/Aluminum: Used with aluminum or in applications susceptible to rust and corrosion. Aluminum/Steel: Similar to aluminum/aluminum but provides a higher strength. Stainless/Stainless: Used with steel or aluminum for very high strength, and is not susceptible to rust and corrosion. Stainless/Steel: Also used with steel or aluminum for very high strength but is susceptible to rust and corrosion. Steel/Steel: Used with steel for high strength. The two primary types of rivets are Open End and Closed End. Open End Rivets are designed for a wide range of applications and are the most commonly used type of rivet. The mandrel breaks near the blind-side head and has flanges or countersunk heads for use in thin-gauge metals and low-strength materials. They may also retain the end of the mandrel within the rivet body when set for added strength. Closed End Rivets have a cup-shaped end that forms a tight seal against the bonded materials and captures the end of the mandrel within the rivet body for added strength. Closed end rivets are stronger than open end rivets. The three primary rivet head styles are: Dome Head, Large Flange and Countersunk. Dome Head Rivets are low profile and the most commonly used type of rivet. The head size is twice the diameter of the rivet body and provides enough bearing surface for most applications other than soft or brittle material. Large Flange Rivets are also low profile but provide twice the under-head bearing surface as a dome head rivet. These rivets are commonly used to fasten soft or brittle material to a rigid backing surface. Countersunk Rivets are designed with a 120 degree head profile that allow for flush mounting applications. A countersunk drill bit must be used to provide the proper hole when installing a countersunk rivet. Selecting the right blind rivet for your application requires understanding the rivet diameter, grip range, head style, flange size and corrosion resistance. We’ve already touched on head style and corrosion resistance, so let’s look at rivet diameter, grip range and flange size. Rivet diameter: Blind rivets are available in diameters from 3/32″ to ¼” in 1/32″ increments. Diameter selection is based on space, strength, and material thickness. The larger the diameter, the higher the shear and tensile strength, which is due to the thickness and material of the rivet body. Grip range: A rivet’s grip range is how wide the rivet’s body (the area shown as “B”, the body) will expand to when placed in the hole and then squeezed. The materials being joined must have a thickness that falls within a rivet’s grip range. Grip ranges increase in 1/16″ increments. A 1/2″ grip range is usually the maximum length attained by standard mandrels. Peel Split: Peel split rivets are designed for improved support in brittle or soft materials. The mandrel of peel rivets is designed to split the end of the rivet body into four separate legs to create a large blindside bearing surface. The legs clamp the material tightly and spread the load over a wide area. This significantly reduces the risk of the rivet breaking through brittle material or sinking into soft materials. Peel rivets are best suited for joining plastics, rubber, wood, and laminates. T-Rivets: T-Rivets are a type of peel split rivet. They are made for structural and high stress applications. T-rivets have a hardened steel mandrel that splits the rivet body into a trifurcated (three-forked) shape. The three-forked shape provides a high clamping strength. Leg Retaining: As the name suggests, a leg retention rivet maintains several “legs” when installed, providing a high clamping strength. Self-Piercing: Self-piercing rivets utilize a high-speed mechanical fastening process for point joining sheet material such as steel and aluminium. It uses a single-step technique to clinch the sheets in a mechanical joint. As the name suggests, pre-drilled holes are not required, allowing the joint to be made rapidly in one operation. This type of rivet is used to connect Ford’s aluminum pickup truck beds.